SteelGuard 65 is an asphalt sealcoat product specifically designed by RaynGuard that is readily applied to pavement surfaces in cooler climates. The dynamics of the active materials in SteelGuard 65 contribute to having a reliable product that effectively dries quicker than many other sealcoat materials in cooler weather. How can Steelguard_65 help you in poor weather? Sealcoat construction is all about drying. 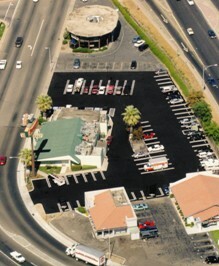 Every product is designed to use water as a carrying agent to bring a coating of asphalt to protect a pavement surface. During hot summer weather temperatures nearly all products dry quickly, but in cooler times of the year, SteelGuard and especially SteelGuard 65 dry quickly, often much quicker than other materials. With SteelGuard 65 it takes less material to produce better results. SteelGuard 65 is 65% solids. Do the math—one coat of SteelGuard 65 gives your customer more material than two coats of the typical asphalt sealer—for less money.